From the 1940s until the late 1960s, typewriters were the main means of data entry and output for computing, becoming integrated into what were known as computer terminals. Because of the limitations of terminals based upon printed text in comparison to the growth in data storage, processing and transmission, a general move toward video-based computer terminals was effected by the 1970s, starting with the Datapoint 3300 in 1967. Further the keyboard size depends on the extent to which a system is used where a single action is produced by a combination of subsequent or simultaneous keystrokes (with modifier keys, see below), or multiple pressing of a single key. A keyboard with few keys is called a keypad. See also text entry interface. Standard alphanumeric keyboards have keys that are on three-quarter inch centers (0.750 inches, 19.05 mm), and have a key travel of at least 0.150 inches (3.81 mm). Desktop computer keyboards, such as the 101-key US traditional keyboards or the 104-key Windows keyboards, include alphabetic characters, punctuation symbols, numbers and a variety of function keys. The internationally common 102/104 key keyboards have a smaller left shift key and an additional key with some more symbols between that and the letter to its right (usually Z or Y). Also the enter key is usually shaped differently. Computer keyboards are similar to electric-typewriter keyboards but contain additional keys, such as the command or Windows keys. There is no standard computer keyboard, although many manufacture imitate the keyboard of PCs. There are actually three different PC keyboard: the original PC keyboard with 84 keys, the AT keyboard also with 84 keys and the enhanced keyboard with 101 keys. The three differ somewhat in the placement of function keys, the control keys, the return key, and the shift key. Flexible keyboards are a junction between normal type and laptop type keyboards: normal from the full arrangement of keys, and laptop from the short key distance. Additionally, the flexibility allows the user to fold/roll the keyboard for better storage and transfer. However, for typing the keyboard must be resting on a hard surface. The vast majority of flexible keyboards in the market are made from silicone; this material makes them water and dust proof, a very pleasant feature especially in hospitals where keyboards are subjected to frequent washing. For connection with the computer the keyboards use a USB cable, and operating system support reaches as far back as Windows 2000. A chorded keyboard allows users to press several keys simultaneously. For example, the GKOS keyboard has been designed for small wireless devices. 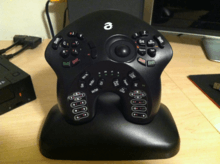 Other two-handed alternatives more akin to a game controller, such as the AlphaGrip, are also used to input data and text. Modifier keys are special keys that modify the normal action of another key, when the two are pressed in combination. For example, <Alt> + <F4> in Microsoft Windows will close the program in an active window. In contrast, pressing just <F4> will probably do nothing, unless assigned a specific function in a particular program. By themselves, modifier keys usually do nothing. The most widely used modifier keys include the Control key, Shift key and the Alt key. The AltGr key is used to access additional symbols for keys that have three symbols printed on them. On the Macintosh and Apple keyboards, the modifier keys are the Option key and Command key, respectively. 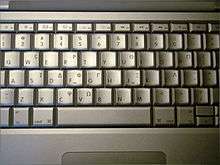 On MIT computer keyboards, the Meta key is used as a modifier and for Windows keyboards, there is a Windows key. Compact keyboard layouts often use a Fn key. "Dead keys" allow placement of a diacritic mark, such as an accent, on the following letter (e.g., the Compose key). The Enter/Return key typically causes a command line, window form or dialog box to operate its default function, which is typically to finish an "entry" and begin the desired process. In word processing applications, pressing the enter key ends a paragraph and starts a new one. The SysRq and Print screen commands often share the same key. SysRq was used in earlier computers as a "panic" button to recover from crashes (and it is still used in this sense to some extent by the Linux kernel; see Magic SysRq key). The Print screen command used to capture the entire screen and send it to the printer, but in the present it usually puts a screenshot in the clipboard. The Break key/Pause key no longer has a well-defined purpose. Its origins go back to teleprinter users, who wanted a key that would temporarily interrupt the communications line. The Break key can be used by software in several different ways, such as to switch between multiple login sessions, to terminate a program, or to interrupt a modem connection. In programming, especially old DOS-style BASIC, Pascal and C, Break is used (in conjunction with Ctrl) to stop program execution. In addition to this, Linux and variants, as well as many DOS programs, treat this combination the same as Ctrl+C. 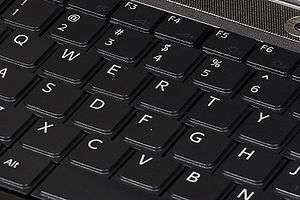 On modern keyboards, the break key is usually labeled Pause/Break. In most Windows environments, the key combination Windows key+Pause brings up the system properties. The Escape key (often abbreviated Esc) is used to initiate an escape sequence. 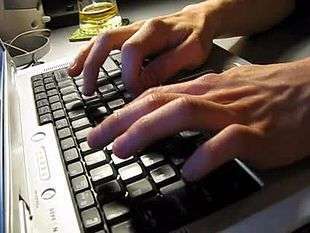 As most computer users no longer are concerned with the details of controlling their computer's peripherals, the task for which the escape sequences were originally designed, the escape key was appropriated by application programmers, most often to "escape" or back out of a mistaken command. This use continues today in Microsoft Windows's use of escape as a shortcut in dialog boxes for No, Quit, Exit, Cancel, or Abort. A common application today of the Esc key is as a shortcut key for the Stop button in many web browsers. On machines running Microsoft Windows, prior to the implementation of the Windows key on keyboards, the typical practice for invoking the "start" button was to hold down the control key and press escape. This process still works in Windows 2000, XP, Vista, 7, 8, and 10. 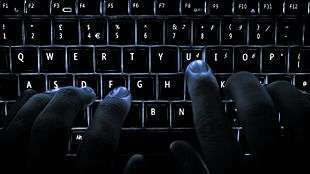 The Enter key is located: One in the alphanumeric keys and the other one is in the numeric keys. When one worked something on their computer and wanted to do something with their work, pressing the enter key would do the command they ordered. Another function is to create a space for next paragraph. When one typed and finished typing a paragraph and they wanted to have a second paragraph, they could press enter and it would do spacing. Shift key: when one presses shift and a letter, it will capitalize the letter pressed with the shift key. Another use is to type more symbols than appear to be available, for instance the apostrophe key is accompanied with a quotation mark on the top. If one wants to type the quotation mark but pressed that key alone, the symbol that would appear would be the apostrophe. The quotation mark will only appear if both the required key and the Shift key are pressed. The Menu key or Application key is a key found on Windows-oriented computer keyboards. It is used to launch a context menu with the keyboard rather than with the usual right mouse button. The key's symbol is usually a small icon depicting a cursor hovering above a menu. On some Samsung keyboards the cursor in the icon is not present, showing the menu only. This key was created at the same time as the Windows key. This key is normally used when the right mouse button is not present on the mouse. Some Windows public terminals do not have a Menu key on their keyboard to prevent users from right-clicking (however, in many Windows applications, a similar functionality can be invoked with the Shift+F10 keyboard shortcut). Many, but not all,computer keyboards have a numeric keypad to the right of the alphabetic keyboard which contains numbers, basic mathematical symbols (e.g., addition, subtraction, etc. ), and a few function keys. On Japanese/Korean keyboards, there may be Language input keys for changing the language to use. 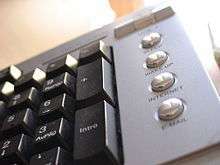 Some keyboards have power management keys (e.g., power key, sleep key and wake key); Internet keys to access a web browser or E-mail; and/or multimedia keys, such as volume controls or keys that can be programmed by the user to launch a specified software or command like launching a game or minimize all windows. In the first electronic keyboards in the early 1970s, the key switches were individual switches inserted into holes in metal frames. These keyboards cost from USD $80 to $120 and were used in mainframe data terminals. The most popular switch types were reed switches (contacts enclosed in a vacuum in a glass capsule, affected by a magnet mounted on the switch plunger). In 1978, Key Tronic Corporation introduced keyboards with capacitive-based switches, one of the first keyboard technologies to not use self-contained switches. There was simply a sponge pad with a conductive-coated Mylar plastic sheet on the switch plunger, and two half-moon trace patterns on the printed circuit board below. As the key was depressed, the capacitance between the plunger pad and the patterns on the PCB below changed, which was detected by integrated circuits (IC). These keyboards were claimed to have the same reliability as the other "solid-state switch" keyboards such as inductive and Hall-Effect, but competitive with direct-contact keyboards. Prices of $60 for keyboards were achieved and Key Tronic rapidly became the largest independent keyboard manufacturer. 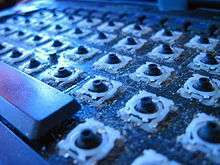 Meanwhile, IBM made their own keyboards, using their own patented technology: Keys on older IBM keyboards were made with a "buckling spring" mechanism, in which a coil spring under the key buckles under pressure from the user's finger, triggering a hammer that presses two plastic sheets (membranes) with conductive traces together, completing a circuit. This produces a clicking sound, and gives physical feedback for the typist indicating that the key has been depressed. The first electronic keyboards had a typewriter key travel distance of 0.187 inches (4.75 mm), keytops were a half-inch (12.7 mm) high, and keyboards were about two inches (5 cm) thick. Over time, less key travel was accepted in the market, finally landing on 0.110 inches (2.79 mm). Coincident with this, Key Tronic was the first company to introduce a keyboard which was only about one inch thick. And now keyboards measure only about a half-inch thick. Some adaptive technology ranging from special keyboards, mouse replacements and pen tablet interfaces to speech recognition software can reduce the risk of injury. Pause software reminds the user to pause frequently. 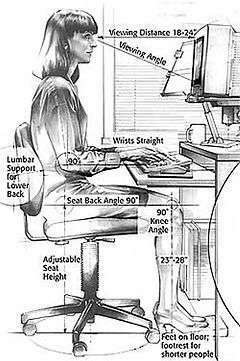 Switching to a much more ergonomic mouse, such as a vertical mouse or joystick mouse may provide relief. Switching from using a mouse to using a stylus pen with graphic tablet or a trackpad can lessen the repetitive strain on the arms and hands. ↑ Andy Smith (15 June 2011). "Gallery: IBM: 100 Years of THINKing Big". ZDNet. Retrieved 20 October 2015. ↑ AlphaGrip Programming andProductivity Improvement White Paper. Alphagrips.com. Retrieved on 2013-12-09. ↑ The Alphagrip – The World's most Comfortable Ergonomic Keyboard for Typing and Programming. Alphagrips.com. Retrieved on 2013-12-09. ↑ Brownie, John (8 March 2014). "Ukelele [sic]". NRSI: Computers & Writing Systems. SIL International. Retrieved 8 December 2014. ↑ "This Fake Phone Charger Is Actually Recording Every Key You Type". TechCrunch. AOL. 14 January 2015. ↑ "How To Login From an Internet Cafe Without Worrying About Keyloggers" (PDF). Retrieved 2012-03-28. ↑ "6 Tips To Secure Webcams, Stop Keyloggers". Dark Reading. ↑ Radiology Society of North America The Way You Sit Will Never Be the Same! Alterations of Lumbosacral Curvature and Intervertebral Disc Morphology in Normal Subjects in Variable Sitting Positions Using Whole-body Positional MRI. ↑ "Keyboard: Dirtier Than a Toilet – ABC News". Abcnews.go.com. 2008-05-05. Retrieved 2012-03-28.